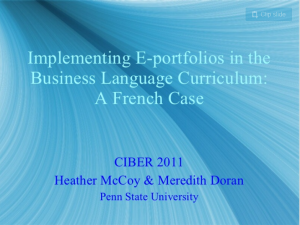 Here is a slideshow by two colleagues who implemented e-Portfolios in a French Business language course at Penn State. Take a look at the presentation Heather McCoy and Meredith Doran gave at the 2011 CIBER conference. Go to CALPER’s slideshow at Slideshare.